The fast moving consumer goods (FMCG) industry has undergone a series of changes culminating in a complex, data-rich marketplace. With omnichannel sales and marketing, people have more choices than ever before about where they’ll spend their money and how they’ll engage with brands. Plus, connected consumers have access to tons of product information at their fingertips, which means they’re more discerning about their choices than they’ve been previously. Likewise, companies have more touchpoints with customers, though catching consumers’ attention can be a challenge when they have so many options available and a plethora of ways to spend their time. Such a dynamic landscape requires a dynamic analytics solution that can understand and interpret data quickly. These solutions enable the FMCG industry and the more enveloping consumer packaged goods (CPG) industry to better react to the rapid pace of the market. Your FMCG data should provide an edge over your competition. Your dashboards should be self-service. Your data analysts shouldn’t be stuck in a backlog of questions. 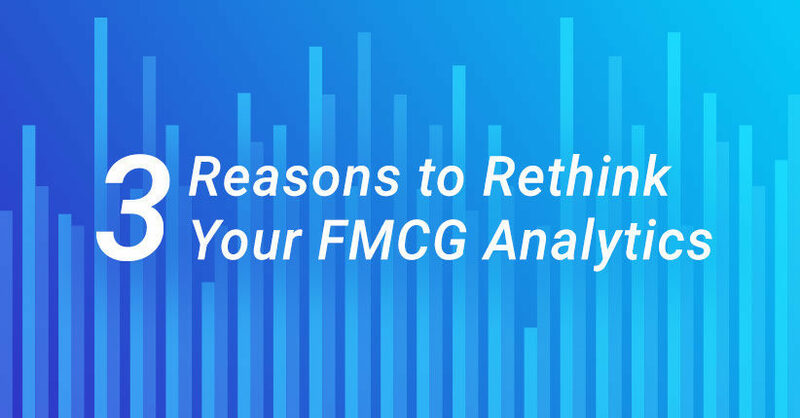 Learn more about how FMCGs can approach data and analytics in a highly effective way. 1. Your FMCG data should provide an edge over your competition. Big name brands may have staying power, but smaller brands are gaining footholds in the FMCG industry. In fact, smaller brands “account for 19% of dollar sales and are driving more than half of the growth (53%),” according to Nielsen. The impact of smaller brands is especially significant given the general downturn of the FMCG industry (according, again, to Nielsen’s data), so understanding how your brands fit into this context is key. For large brands, that means holding onto market share, diving deep into declining performance, and identifying growth pockets that you can leverage. On the other hand, smaller brands are uniquely poised to thrive — which means an impeccable analytics solution has the potential to provide a greater ROI than it would previously. Regardless of the size of your brand(s), high-quality, syndicated data sources provide vital context for your data, and a good analytics solution will have partnerships with major data purveyors (such as Nielsen, quoted above). To edge out your competitors, work with a CPG analytics solution that can help you sift through the copious amounts of data and quickly make sense of it. You need to be able to look at your own data as well as syndicated data, so identify an analytics solution that gives you instant access to all that you need. You don’t want your team to spend its time searching for answers. Instead, they should be thinking critically about how to make meaningful decisions based on those answers. When you can see marketplace data holistically, you can understand your brands’ performance in the right context. No brand is an island, after all. Gaining a competitive edge is much easier with a seamless analytics solution that pulls the market’s most comprehensive data into a format that’s easy to understand. Behind-the-scenes, analytics tools that work with syndicated data sources require a deep understanding to accommodate both aggregatable and pre-aggregated data together. On the user end, business people can simply ask questions of this data and receive instant answers. The power of AI-driven analytics platforms is simplifying complex, dynamic data sources into a format that non-technical people can easily access and use. Now that we’ve touched on data sources like Nielsen, let’s talk about how your analytics can improve productivity with a responsive solution. 2. Your dashboards should be self-service. Dashboards are a feature of most business intelligence tools and provide a general overview of your data in scannable visualizations. When we talk about dashboards, it’s easy to imagine them as a reporting tool, something static that’s put together by a data analyst who’s responding to a query from a business user. To take FMCG analytics to the next level, dashboards should be responsive, interactive assets. Your business users likely have lots of questions about their customers and prospects. If your analytics approach hasn’t evolved, their data view may be limited to a dashboard of fixed metrics and whatever ad hoc reporting their technical counterparts have bandwidth to produce. When business users must rely on data analysts to construct dashboards, they often opt out of asking follow-ups because of the time investment and labor involved. When only technical users can generate dashboards, data analysts can easily get overloaded with requests from business users. Business users can’t easily ask follow-up questions or drill down into interesting data with traditional dashboards. Dashboards — designed as visual assets — have limited presentation potential when they show something unexpected that a business user can’t figure out on their own. The process of asking for and generating dashboards can stifle proactivity. A days- or weeks- long process prevents users from accessing your most current data and forces them to weigh the benefits of asking follow-up questions against hard deadlines. All of this to say that dashboards as they’re traditionally conceived don’t always address the needs of FMCGs, especially in this modern, dynamic landscape. For FMCGs, self-service dashboards are key, which means that your team no longer has to rely on data analysts to 1) create the dashboard and 2) interpret it. Allow your team, including non-technical users, to create dashboards themselves without deviating from their normal workflow. Intuitive analytics tools can populate dashboards automatically as business people type in their questions and follow-ups. These kinds of interactive dashboards allow people to ask questions, get a visualization, and drill down into the data further. A dashboard should maintain a level of intelligence in its own right — that is, it should understand what your users’ intentions are so that you can ask multiple questions, refine your meaning, and build on the information you learn. From the business user’s reference point, this process should be as simple as possible. Nearly everyone is familiar with search tools that allow you to type — or verbally speak — questions and that auto-populate suggested search terms. Analytics tools that replicate these functions streamline use. The ability to simply ask “what was penetration for Brand A in the southeast in 2017” and receive an answer is no longer technology of the future. Even further, open-ended questions like “why are sales down last quarter” and “how can we increase sales next year” can be tackled with advanced AI solutions at the forefront of the business intelligence market. The more people who can understand your FMCG data, the faster your business as a whole can identify opportunities to grow and pinpoint potential challenges. Dashboards should work in conjunction with self-service analytics to empower your team to proactively seek out information that enables them to act with conviction and understanding. As such, whichever solution you choose should ease your team’s repetitive workload so that they can focus on the bigger picture— which brings us to our next point. 3. Your data analysts shouldn’t be stuck in a backlog of questions. As discussed previously, data analysts can easily be overworked when they’re the primary source of reports. Business users who make critical decisions aren’t operating off of current, complete information because they can’t ask follow-up questions. Data analysts become frustrated and bogged down with tons of requests that are time-consuming to generate, but ultimately simplistic when it comes to the intricacies of data and what it can mean for your business. This scenario, though common, is inefficient and puts undue burden on your employees. Plus, top analysts are in high demand; if your team is using analysts to complete monotonous tasks, you may lose them. That’s why self-service analytics are becoming so integral to FMCGs. The pace of the market demands fast tools that can address daily, weekly, and monthly questions that affect ongoing decisions. Instantaneous reporting mitigates the risk of outdated dashboards, enabling your team to act quickly, pivot toward opportunities, and flex your business strategy to the nuances of the market. It’s all too easy to position your team to react to your data instead of proactively setting business strategy. After all, with general declines in the FMCG industry, uncertainty can feel like the norm, and pressure is mounting for brand and category managers to pinpoint growth pockets and reverse decline. Foster a “cycle of curiosity” among your team by encouraging them to ask questions as they come up and giving them the tools to find the respective answers just as quickly. In this new CPG landscape, it’s easy to be outpaced by fast-acting competitors, so, by extension, getting timely answers to important strategy questions is a must. When data analysts become a bottleneck in the process, your team is more inclined to act quickly but on incomplete information. Self-service analytics, on the other hand, empowers your business team to make decisions on their own and frees up your data analysts’ time so that they can focus their energy on the more complex aspects of your data. The result? A better, more complete picture of your data with responsive dashboards and comprehensive market data. With so much competition in the FMCG and CPG space, analytics that are designed for your entire team can maximize your productivity and, ultimately, your impact toward your bottom line.